Ministers, ambassadors and envoys from at least 15 countries, including Maroš Šefčovič, the European Commission’s Vice President for the Energy Union, are gathered today in the Azerbaijani capital to discuss the progress on the Southern Gas Corridor, the largest energy project the EU is currently pursuing. But over the past couple of months, it seems the European Commission’s justifications for this controversial undertaking have been crumbling by the day. A growing number of civil society organisations, including Human Rights Watch, have been warning about the EU locking arms with the Azerbaijan’s authoritarian ruler Ilham Aliyev, despite Europe’s commitment to human rights. In a recent response to a question from MEP Xabier Benito (Podemos) regarding the SGC project, the EU’s energy and climate action commissioner Miguel Arias Cañete stated that the EU’s High Commissioner for Foreign Affairs and Security Policy Federica Mogherini had brought up the issue in a recent meeting with the Azerbaijani president and foreign minister. “Cooperation with Azerbaijan on energy issues including the SGC is a further means for engagement and in full respect of fundamental values and principles.” For now, it seems EU leaders are mostly willing to turn a blind eye to the Azerbaijani government’s ongoing crackdown on civil society and journalists in the country. In fact, it looks like Brussels is even willing to embrace Azerbaijan’s lack of transparency. The Commission made sure to stifle any advance information about the date of the Azerbaijani president’s visit to Brussels earlier this month. Yet, in an open letter published last month, jailed Azerbaijani dissident Ilgar Mammadov delivered the latest warning to European leaders about engaging with the Azerbaijani regime. “Recently, Aliyev has been trying to present the SGC as his generous gift to the west so that governments will not talk about human rights and democracy in Azerbaijan,” he wrote from his prison cell. In two weeks Azerbaijan will need to show what it has done over the past four months to improve its so far horrid human rights record. The board of the Extractive Industries Transparency Initiative (EITI) has already decided to suspend Azerbaijan’s membership over its failure to comply with the international body’s standards. At its meeting on March 8-9, the board, which has already given Baku a second chance, will decide whether it can now restore its status. So far, there is little to indicate that the Azerbaijani leadership has any understanding of what human rights even means. The European Bank for Reconstruction and Development (EBRD) has already said that the funding it is considering for the Trans Anatolian Pipeline, the SGC’s Turkish section, is dependent on Azerbaijan’s EITI status. In the meantime, EU leaders’ feeble response to concerns around Europe’s commitment to human rights when dealing with Azerbaijan leaves no doubt about their shared commitment to dirty fossil fuels. In his answer to MEP Benito’s question, Commissioner Cañete also confirmed that no climate assessment has been done for the EU’s largest fossil fuels project. Rather, he tried to rationalize this by claiming that “gaining access to gas from new sources under competitive market conditions should enable countries in South East Europe to replace some of the most polluting lignite power stations with efficient gas turbines.” But the environment commissioner did not bother explaining how this could be in line with the EU’s renewables goals and the Commission’s ‘energy efficiency first’ principle. Not least worrying is that even the Commission’s narrative on the SGC as a way to diversify the EU’s energy suppliers is becoming increasingly questionable. The massive pipeline, carrying Azerbaijani gas, EU policymakers have repeatedly said, would help the EU lessen its dependence on Russian gas imports. But now it seems that the Trans Adriatic Pipeline (TAP), the western leg of the SGC, could in fact be used to deliver Russian gas into Europe. In late January, Gazprom’s deputy head told attendees to the European Gas Conference that his company is interested in using TAP, likely by connecting the Turkish Stream pipeline to it, for shipping Russian gas to Europe. And turns out that a number of the members of the TAP consortium, including Azerbaijan’s energy firm SOCAR, would actually be in favour of this scenario. But the news about Moscow’s interest in the Southern Gas Corridor really should not come as a surprise. TAP’s country manager for Italy already told Italian investigative journalists that the pipeline could carry Russian gas. What’s more, another Russian energy giant, Lukoil, is already one of the companies developing Shah Deniz II, the Azerbaijani gas field intended as the source for the SGC. The EBRD has even arranged a half billion dollar loan for Lukoil’s share in the Shah Deniz II project, which was then matched by another loan from the Asian Development Bank. 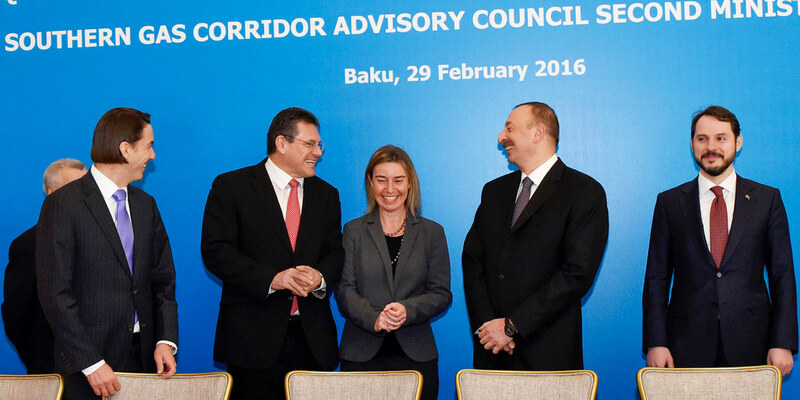 What, then, could be the EU’s motivations to advance a project as massive as the Southern Gas Corridor? Hopefully the European Commission and governments can offer more convincing answers, because it surely isn’t about promoting human rights, tackling climate change, or even mitigating the EU’s dependence on Russia.